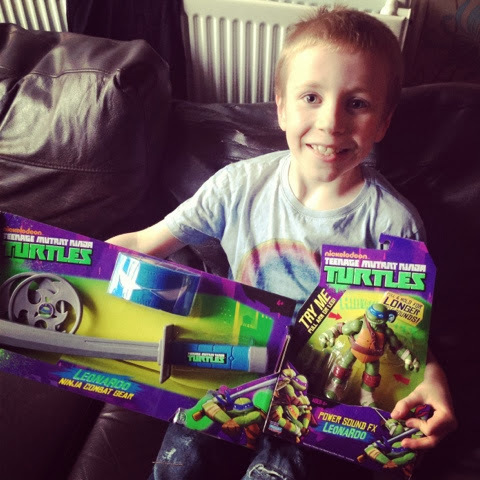 When parcels arrive in the post from Flair Jamster gets incredibly excited as they are the brand behind some of his favourite toys - The Trash Pack, Tom and Jerry and of course Teenage Mutant Ninja Turtles! We received a Power Sound figure and a Combat Gear Set to play. Each Power Sound FX figure is 5.5" tall and is suitable for children aged 4+. We just happened to receive Leonardo; the turtles leader and Jamster's favourite character! By pulling the right arm or left leg of the figure, which feature an activation system, you can hear some battle phrases and sound effects to make play just that little bit more exciting. If you hold the limb for longer it reverberates the phrase too. Leonardo comes complete with his signature weapons of Katana swords which attach to his shell with ease. He is articulate and a great replica of the character from the Nickelodeon TV series which again Jamster is a big fan of. If the batteries (3 button cell) run out you can easily unscrew the battery cap shell to change them so the fun can continue. Jamster has really enjoyed playing with this so far alongside his other figures from the range! I did worry that pulling the limbs to activate the sounds would damage them but it seems really robust. The Combat Gear Set includes a coloured bandana to match the turtle and signature weapons - Your child can enjoy some role play fun as a ninja! I did have to remind Jamster not to actually strike people (he thought he was an actual turtle at times I think and got carried away) but otherwise the set is ideal for getting kids active through play and they can imagine they are an actual part of the green gang. 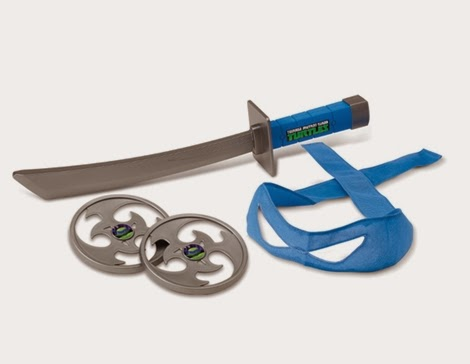 The Katana sword makes noises and the bandana is easy to adjust to fit both children... and adults. I like to get involved too after all! The two throwing stars are ideal for building hand eye coordination through catching and throwing games and we have had great fun with these in the garden aiming at tins and boxes for accuracy improvement. Do you have a TMNT fan in the family?